Laneige's BB formula is super-thin but offers just enough coverage for trouble spots. It brightens with Melac rusher technology, protects your skin with an SPF of 50+, hydrates skin with Optimal Mineral Water, prevents shine and offers long-lasting coverage. The small pad inside is their patented air cushion, filled with over 800,000 air cells. This pad will apply a thin layer to your face, but the BB foundation still provides coverage for red areas or oily skin. Apply as much or as little as you want without worrying about buildup and cakeface. 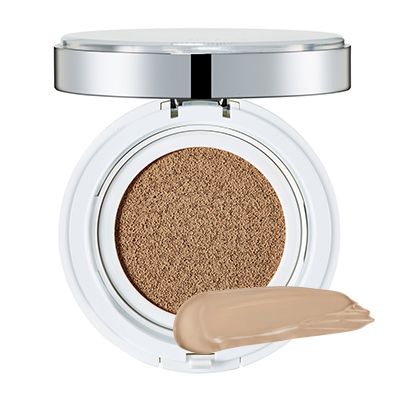 Stick Laneige BB Cushion Compact in your purse or in your pocket, and you're set for a flawless day of makeup. Cushion compacts are popular in Korea, but they are just now hitting the US market. Unfortunately, this means the variety of shades are limited. Target carries three shades of Laneige BB Cushion Compact, but there are more, which you can find on the Laneige website (expect long shipping times, though). The biggest complaint with this product is that there just aren't enough colors available right now. Hopefully, more shades will become available as the product's popularity grows in America. If you want to try Laneige BB Cushion Compact, you can find it at Target.com or in stores.